Millington in the Yorkshire Wolds of the East Riding of Yorkshire is a very small attractive village which houses a pub “The Gait Inn” which is a 16th century family run free house with limited opening hours and a licensed tea room and restaurant “The Ramblers Rest” which welcomes walkers and cyclists. The Ramblers Rest once a farm has recently been extended, on the farm’s former granary, and refurbished to provide luxury guest accommodation. The food is freshly cooked using local and seasonal produce to provide home cooked meals. The tea room is open every day except Tuesday and Wednesday from 10.30am to 5pm in the summer and 10.30am to 4.00pm in the winter. There are many footpaths and bridleways around Millington including The Yorkshire Wolds Way, The Minster Way and The Chalkland Way all giving beautiful views of the surrounding countryside and valleys. 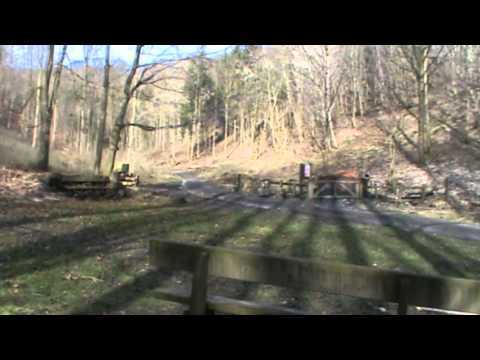 Only a mile away from Millington is Millington Woods and is one of the few remaining wooded dales in the Wolds, well worth a visit, with picnic tables and plenty of benches for a sit down and a relaxing rest. There is also the charcoal burning kiln when working is an amazing site. In the early spring the woods are a carpet of wild garlic and bluebells. A little further on from Millington Woods is Millington Pastures where highland cattle and wildlife such as hares and birds of prey can be seen. We park in the lay-by next to the church at Millington and follow the quiet country road to Millington Woods. At Millington Woods there is a car park if you wish not to do the full walk. We walk along the footpath through the centre of the wood and pass the charcoal burning kiln and then to some steep steps. We go up the steps until we come to a bench here we turn right, but you can carry on up the steps to the top to a viewing point, and follow the footpath back down to the charcoal burning kiln and then the car park. We turn left out of the car park and follow the road along Millington Dale and Millington Pastures until we come to a pond, ford and footbridge on our right. Here you can go over the footbridge go straight ahead and then turn right on the footpath for a short cut back to Millington, but we carry on along the road until we come to the bridleway on the right. Here we take the track going uphill on the right not on the left. At the top we go through the gate and turn right and follow the Wolds Way and then we go very steeply downhill into the valley we passed at the pond, ford and footbridge and then steeply uphill to a gate. At the gate we turn right towards the trees then left then right following the edge of the trees downhill to a gate with a stile. We go over the stile and turn left and walk through the large field keeping to the fence on our left until we reach a gate in the corner of the field we go over the stile and turn right going downhill to a beck with a footbridge and boarding. After crossing the footbridge we follow the track and another small beck on our left up to the road passing a small pond on our right. On reaching the road we turn left and walk through Millington village to have a look at The Ramblers Rest and The Gait Inn and then carry on following the road round back to the church. Approx 6 miles using OS Explorer Map 294. Millington set in the Wolds of the East Riding of Yorkshire. From the east of York take the A166 for Stamford Bridge and Bridlington. Pass through Stamford Bridge and head up Garrowby Hill. At the top of Garrowby Hill take the small road on the right signposted Givendale and Millington. Stay on this road passing Great Givendale on the right and then take the next left which takes you to the church at Millington where there is parking. Millington Woods is another 1 mile further on where there is also parking. There are no public toilets in Millington the nearest ones are at Pocklington. For refreshments there is The Ramblers Rest Tea Rooms and Restaurant and The Gait Inn in Millington village. These are similar quality and work equally well.